In this short essay, however, I want to suggest that the Trump administration’s actual impact on the industry will be far less dramatic, because the administration is constrained by three potent forces. A third moderating influence stems from legal constraints on the administration’s ability to convince states to turn their backs on reforms. Under the Supreme Court’s anticommandeering rule, of course, the attorney general cannot simply order the states to reinstate their prohibitions on marijuana.12 But under rules governing conditional spending, he can’t even pressure them to do so, the way he’s now pressuring cities to abandon their sanctuary policies by threatening to withhold federal law-enforcement grant funding from them. That’s because no congressional statute clearly conditions the receipt of federal grants on the states helping the DOJ to enforce the federal marijuana ban. In any event, Congress would have a tough time convincing the states to abandon their reforms voluntarily, given the substantial tax revenues they now glean from the licensed marijuana industry. In sum, while it is clear that the new attorney general opposes state marijuana reforms, it is less clear what he will or even could do to block those reforms or to curb the industry that has flourished under them. The popularity of reforms, limits on federal resources, and legal doctrines like the anticommandeering rule all limit the DOJ’s ability to shut down the state-licensed marijuana industry. While Jeff Sessions may never embrace reforms, he may choose to pursue other tactics, like anti-marijuana media campaigns, to curb the use of marijuana and the harms caused thereby. Only time will tell, of course, but if history is any guide, the state marijuana industry will survive the Trump administration intact. * Professor of law, Vanderbilt University Law School. I want to thank Aaron Rothbaum for his helpful research assistance on this essay. 1 See Robert A. Mikos, Marijuana Law, Policy, and Authority 3, fig. 1 (Aspen 2017). 3 See e.g., Debra Borchardt, 5 Ways Trump Could Affect the Marijuana Industry, Forbes (Jan. 20, 2017), https://www.forbes.com/sites/debraborchardt/2017/01/20/5-ways-trump-could-affect-the-marijuana-industry/#4008a2622ed7; Mark Joseph Stern, Spicer: Trump Supports States’ Rights to Discriminate Against Trans Kids but Not to Legalize Pot, Slate (Feb. 23, 2017, 5:21 PM), http://www.slate.com/blogs/the_slatest/2017/02/23/spicer_says_trump_will_prosecute_recreational_marijuana.html; Paul Waldman, Will Jeff Sessions Launch a War on Weed?, Wash. Post (Apr. 20, 2017), https://www.washingtonpost.com/blogs/plum-line/wp/2017/04/20/will-jeff-sessions-launch-a-war-on-weed-if-so-it-could-accelerate-marijuana-legalization/?utm_term=.7fc1984aff44; Alicia Wallace, ‘Something’s Going to Have to Give’: An Untenable Conflict Between Feds, Legalized States, Cannabist (Mar. 6, 2017), http://www.thecannabist.co/2017/03/06/trump-marijuana-legalization-industry-lobbyists/74960/. 4 See Waldman, supra note 3 (noting poll results). 5 See generally David S. Schwartz, Presidential Politics as a Safeguard of Federalism: The Case of Marijuana Legalization, 62 Buff. L. Rev. 599, 601–02 (2014) (suggesting that the need to win swing states may curb Presidential candidates’ enthusiasm for enforcing the federal marijuana ban). 6 See Robert A. Mikos, A Critical Appraisal of the Department of Justice’s New Approach to Medical Marijuana, 22 Stan. L. & Pol’y Rev. 633, 643–46 (2011) (discussing the limits on the attorney general’s influence over lower level DOJ officials). 7 United States v. McIntosh, 833 F.3d 1163, 1175, 1177 (9th Cir. 2016). 8 See Waldman, supra note 3. 9 See Robert A. Mikos, On the Limits of Supremacy: Medical Marijuana and the States’ Overlooked Power to Legalize Federal Crime, 62 Vand. L. Rev. 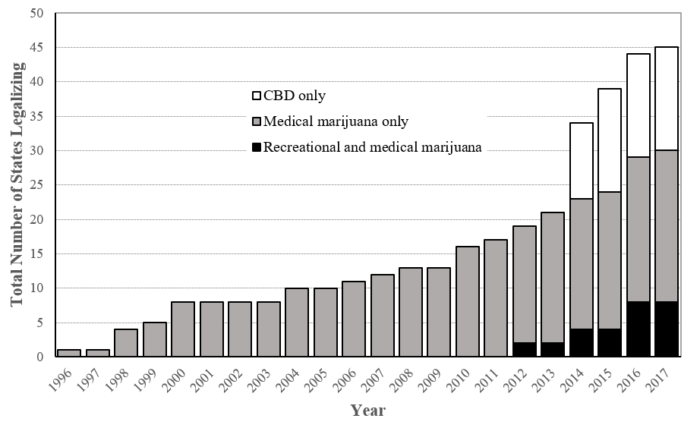 1421, 1467 (2009) (discussing de facto limits on federal government’s influence over marijuana). 10 See Robert A. Mikos, Preemption Under the Controlled Substances Act, 16 J. Health Care L. & Pol’y 5 (2013). 12 Mikos, On the Limits, supra note 9, at 1455–60.